* The committee, management and sponsors enjoyed a successful day at the Ulster Grand National on Sunday at Downpatrick Racecourse. The day was huge success with the group getting plenty of winners and the club would like to thank the Race club and their staff for the hospitality. Speaking at the event club Chairman commentedL “Our sponsors provide a lot of support to the club and we just wanted to show our appreciation, were better for us to that than at this wonderful facility”. * Tickets for Garth Brooks on Saturday the 12 April are continuing to sell in Murphy’s Stores, they are priced at £10.00 with one lucky winner on the night winning two tickets to see the main man himself in Dublin. * The first team travel to play Larne Tech this Saturday in the league, the seconds travel to Play Ardglass Swifts in the Supplementary Cup. Both games kick off at 2.00pm. * Downpatrick Ladies have another pre-season friendly on Monday 31 March when they play Ballynahinch Ladies at the Assumption Grammar School 4G Pitch. This game kicks off at 8.30pm. 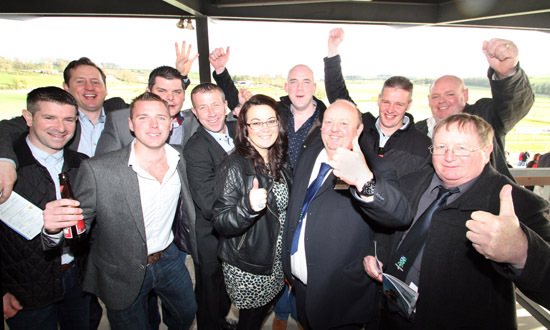 Downpatrick FC committee, management and sponsors at the Downpatrick Race Course waiting for the Ulster Grand National.